​​"...the thing I like most is how it [Slow Money] brings together like-minded people and gives them the ability to make a true impact in establishing our local small chain food supply." Pono Pies will use 8,000 pounds of Maui grown breadfruit in pies and hummus this year. ​Our smallest loan was $700 and paid for installation of on-farm facilities for visiting school children to Holoholo Farm. 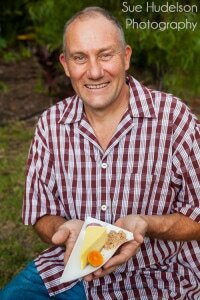 Maui Breadfruit Co. borrowed $10,000 from five lenders for bulk printing of its Pono Pies labels. 'I'o Farms used their loan livestock fencing while Ludavico Farms' loan helped them increase their chicken slaughter capacity, and the Hawaii Ulu Producers Cooperative bought freezers and Living Aquaponics built an on-farm road. Loan terms are typically three to five years with interest rates between 2% and 5%. ​If you're on a tight budget you can still be a Slow Money lender. With as little as $25 you can join the Slow Money Hawaii KIVA team when we endorse a borrower on the KIVA online global lending platform. Read more about Kiva here and mark the KIVA checkbox on the form below to learn more. Disclaimer: Slow Money Hawaii does not give investment advice, endorsement, analysis or recommendations with respect to any securities or investment. Slow Money Hawaii is not a broker, venture fund, or an investment adviser, nor do Slow Money Hawaii activities constitute an offer to buy or sell securities.